Alan Brignull: The Ajax company, a likely competitor to Adana (see Adana Five-Three), was based in Southend-on-Sea, Essex. The Ajax No. 1, the sister of the flatbed pictured, had an even smaller chase size than the No.2: 5 1/2 x 3 1/8″. 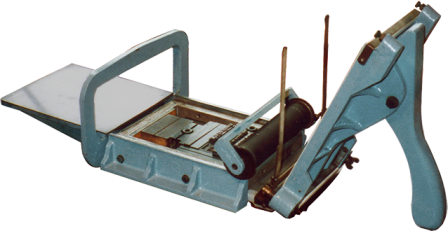 There were also two sizes of platen presses in the Ajax line, similar in appearance to the Adana Eight-Five. Called Ajax Minor and Ajax Major, respectively, they had interesting parallel-approach platen mechanisms.